A camera drone is a type of sound and video recording device used by humans, likely operated by news agencies for recording current events. They hover on several air propellers. Several camera drones present at the award ceremony on Cairo Station just before the Battle of Earth, recording the arrival of MCPO John-117 and Sergeant Major Avery J. Johnson. A camera drone in Halo 2. Closeup of a camera drone. Camera drone from various angles. John-117 with Sergeant Avery Johnson broadcast by hovering camera drones in Halo 2. 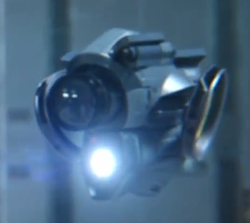 A camera drone in Halo 2: Anniversary.